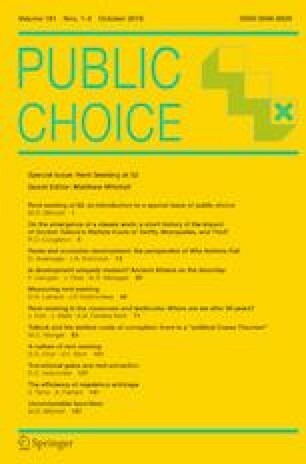 Paper prepared for special issue of Public Choice “Commemorating The 50th Anniversary of Gordon Tullock’s ‘The Welfare Costs of Tariffs, Monopolies, and Theft.’” Credit for suggestions, but no blame for shortcomings, goes to William Keech, Matthew Mitchell, David Schmidtz and David Skarbek. Dwyer, J. (2016). Corruption in New York: A brief history. New York Times. April 19. https://www.nytimes.com/2016/04/20/nyregion/corruption-in-new-york-a-history.html. Le, V. H, de Haan, J. & Dietzenbacher, E. (2013). Do higher government wages reduce corruption? Evidence based on a novel dataset. CESifo Working Paper Series No. 4254. Available at SSRN: https://ssrn.com/abstract=2274648. Romig, R. (2017). How to steal a river, to feed an enormous building boom, India’s relentless sand miners have devastated the waterways that make life there possible. New York Times, March 1. https://www.nytimes.com/2017/03/01/magazine/sand-mining-india-how-to-steal-a-river.html.